Doug said it best, fishing is a great way to really experience life. There is absolutely nothing in this world like reeling in a 30lb fish for over an hour and finally getting that bad boy up on a boat. Fishing in Ketchikan isn’t just about catching fish, it’s the ultimate fishing experience. At Anglers Adventures & Outfitters, we provide fishing excursions that offer a lifetime of memories and fun out on the Alaskan waters. Whether you are a seasoned angler or this is your first time ever out on a boat, we’ve got you covered. Your captain, Brian Ringeisen, has accumulated over 26 years of angling and guiding experience so that you can catch the big fish you’ve always dreamed of. Not only does he run a fun and interactive charter, but he views safety as his top priority. As a former U.S. Coast Guard Captain, he is an expert out on the water and remains well qualified to handle the Alaskan waters. He has maintained his CPR certification and First Aid certification. Additionally, our 28’ Bayline Trophy boat is equipped with all the latest technologies and gear for the modern fisherman, as well as two 225hp Hondas. The boat also has a heated and enclosed cabin and private bathroom so that everyone can remain comfortable during the trip. No matter what type of fishing excursion you decide on, we have the right experience and knowledge of the location to help make your trip one of the best. We have fished all types of Salmon and Halibut (Halibut fishing requires a full day charter) during many different seasons of the year. We currently offer half-day fishing trips, full day trips, and even multi-day excursions – whatever your wild heart desires! Have a specific fishing excursion in mind? Fish spawn at different times of the year! Call us in advance and let us know what you are specifically after and we can book you at their peak season! Fishing in Alaska not only yields fantastic results, it has some great views too! Bald eagles, killer whales, lazy sea lions,etc. 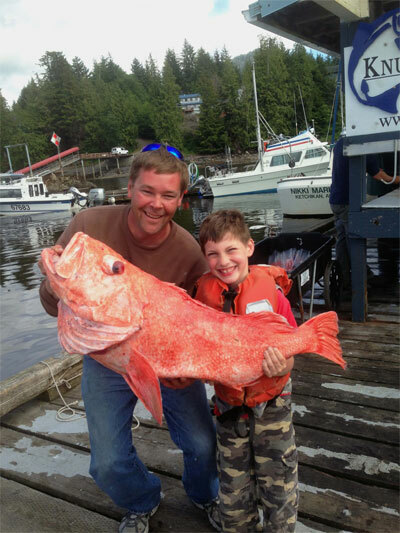 Nothing is out of the question when you are taking a guided Ketchikan fishing trips! For more information about Anglers Adventures & Outfitters and our fishing charters, give us a call today at 907-254-0880.